Along with the new year came a new season for Team 525 Swartdogs. 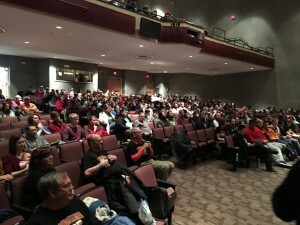 On January 7th, we ran an official FIRST Robotics Competition Kick-off. 25 teams came, excited to learn what the new game would include. The morning featured the reveal of the new game and the opportunity to see parts of the field. Teams were also able to collect their kit of parts. 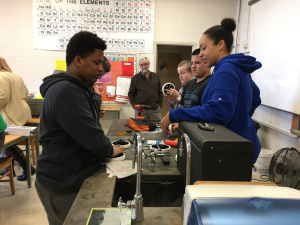 After lunch, Swartdog students and mentors led a variety of workshops which covered topics ranging from control systems to what a regional is like. Quick-build sessions provided help for teams to build their kit bots and learning about using different tools when building it. We would like to give a special thank you to all of the parents, mentors, and volunteers who helped make the kick-off possible. Later that month, we traveled to Iowa State University for the annual Iowa FIRST LEGO League State Championship. Here, we demonstrated our robot, promoted FRC, and presented to FLL students. 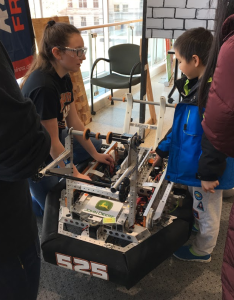 We showed FLL students the next step for students once they have finished FLL. This included a demonstration of our robot throughout the day where students were given the chance to see our robot close-up. We finished the day with a presentation about FRC and our team. 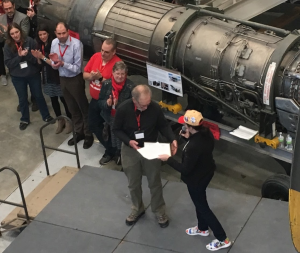 We were also very excited when mentor Neil Kruempel received the Outstanding Volunteer Award for all of his hard work with FLL on the state level. As build season is happening, we are very thankful to all of the parents who have brought food on the weekends and donated supplies for our team. Thank you!